CANCUN, Mexico, November 26, 2010 (ENS) – Events this weekend will cap 350 EARTH, a week-long series of giant public art displays around the planet to help raise awareness of the climate crisis before the United Nations annual climate summit begins in Cancun Monday. Each art installation is visible from space and most of the projects are being photographed by satellites 400 miles above the Earth operated by a Colorado-based company, Digital Globe. 350 EARTH is organized by international climate campaign 350.org, whose name points to goal of reducing the amount of carbon dioxide in the atmosphere from its current level of 390 parts per million to below 350 ppm. The majority of scientists say this atmospheric concentration is the maximum that can accumulate if the planetary temperature increase is to be kept to two degrees Celsius above pre-industrial levels. 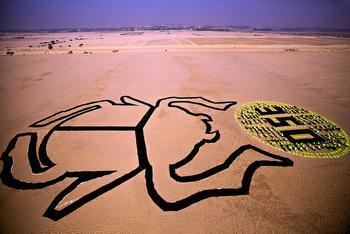 “Art can convey in a different way than science the threat that climate change poses to our planet,” said 350.org founder and environmental author Bill McKibben, who organized 350 EARTH art project. While the Cancun talks are not expected to result in a legally-binding agreement limiting greenhouse gas emissions to carry on when the Kyoto Protocol’s first commitment period expires at the end of 2012, they are expected to result in a shared vision for long-term cooperative action. This vision addresses mitigation, adaptation, finance, technology development and transfer, and capacity-building for developing countries. “The world’s best scientists have tried to wake up politicians to the climate crisis, now we’re counting on artists to help,” said McKibben, who is in Cancun with several of the 350 EARTH artists. Today, in Cairo, Egypt, hundreds of students formed the image of a traditional scarab beetle, a traditional symbol of rebirth and regeneration often depicted on temple walls pushing the ball of the Sun across the sky. The creation of artist Sarah Rifaat, the image represents a call to re-examine humans’ relationship to this perpetual source of clean energy, the Sun. In the Australian Outback, hundreds of people with torches worked with photographer Peter Solness and fire artist Keith Chidzey to create an image of a burning number 350 symbolizing the inevitable increase in wildfires if the amount of carbon dioxide in the atmosphere is not reduced. Also today, more than 1,000 Brazilian children from public schools in Tupa, western Sao Paulo state, formed a Sun in the middle of Brazil’s flag. Tica Minami said the point was “to remind our leaders the huge potential our country has to generate energy from clean and renewable sources.” Solar panels from Brazilian company Blue Sol Solar Energy were also used to form the design. The 350 EARTH project began on November 20 with what McKibben calls a “human flash flood” in Santa Fe, New Mexico. Citizens from the Delta del Ebro area in Catalunya, Spain joined artist Jorge Rodriguez-Gerada to form a giant representation of the face of a young girl who wants to see the Delta survive the threat of climate change. 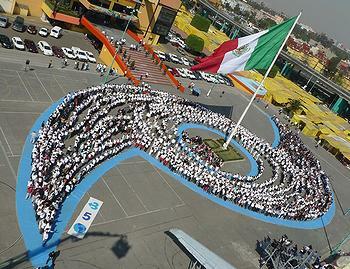 In Mexico City, people created a human hurricane surrounding a 350 in the safe “eye of the storm” to represent the increase in extreme weather that Mexico has been experiencing, as well as the hurricane of citizen action necessary to solve the climate crisis. In Los Angeles, international aerial art innovator John Quigley created a mixed media installation at The Cornfields in Los Angeles Historic State Park. People with solar photovoltaic film sheets formed the image of a solar eagle taking flight to represent clean, renewable, energy independence and global climate solutions from Earth to sky. 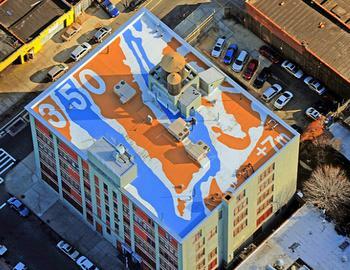 In New York City, artist Molly Dilworth created a “Cool Roof” for a school by painting a lightly colored representation of the New York and New Jersey coastline after a seven meter (23 foot) rise in sea levels. The painting was produced with NYC CoolRoofs, a program launched in September 2009 to mitigate the heat island effect and reduce energy needs as part of New York City’s sustainable energy plan. Dilworth is famous for painting the temporary environmental mural, “Cool Water, Hot Island,” in the plazas on Broadway from 42nd to 47th Streets in Times Square. “We saw a winter garden 350 in Texas, home to oil companies and massive wind power potential alike; a re-created river bed where drought currently plagues the Santa Fe River in New Mexico; a solar eagle taking flight in Los Angeles, air pollution and solar power potential unite; and the rooftop mural in Manhattan depicting sea level rise,” said Boeve. On November 21, in Santo Domingo, Dominican Republic, young people joined with other community members to form the image of a house being submerged by the rising seas that threaten all island nations. In Vancouver, Canada, people gathered to make two giant footprints large enough to be seen from space to represent humanity’s ecological footprint on the planet. 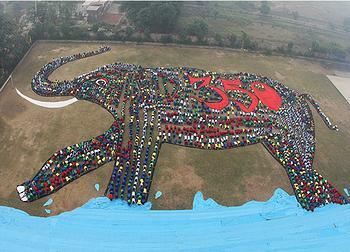 On November 23 in New Delhi, India, 3,000 students from the Ryan International School joined aerial artist Daniel Dancer to form the image of an elephant to remind their leaders that they cannot afford to ignore the elephant in the living room – climate change. The 350 EARTH events continue this weekend. In Cancun, artist Jason deCaires Taylor will unveil a coral reef sculpture made of 400 concrete statues. In Iceland, artists will form a giant polar bear on a glacier, while in Cape Town, South Africa residents will assemble solar cookers into an enormous Sun. Thousands of people will gather on the coast in Brighton-Hove, UK on Saturday to form an image of the legendary Norse ruler King Canute, who unsuccessfully tried to control the ocean waves.